Did you know Wagyu burgers are right on your doorstep? Family pub-restaurant launches eyecatching new seasonal menu. 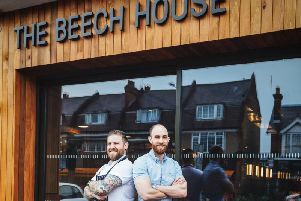 Fresh flavours are the buzz words at The Gate in Chorleywood where a brand new menu has been launched at what is a real hidden gem on the Herts-Bucks border. What greets you first off the Rickmansworth Road is a warm welcome in a stylish setting. This is very much a family friendly environment and whether it’s for a drink with friends or celebrating a special occasion The Gate has the perfect atmosphere to suit. But you’d be missing out if you only visited The Gate for a drink. The new menu has a light and fresh spring theme and but all the usual big hitters are there too. The new Roasted heritage carrot salad (£9.95) on red pepper and cumin purée with feta, avocado, mixed seeds and a dijon mustard vinaigrette is a welcome addition to the menu with its colourful flavour combination. Another new addition to the menu is the whole food salad (£9.95) with rice, quinoa, edamame beans, pumpkin seeds, baby kale and grapes with a pineapple and ginger dressing (you can add chargrilled chicken breast for £3.00/Salmon Supreme £4.00/Goat’s curd £2.00/Grilled halloumi £2.25). On a diet? A number of superfoods mean this particular salad including quinoa, pumpkin seeds and kale, is guilt-free and tasty too. Bit if you’re a big fan of burgers then don’t worry there’s plenty of excitement for you too. One of the new additions to the menu is the Wagyu Burger, priced at a very reasonable £16.95. If you don’t know about wagyu, you will after eating here. This burger is essentially made with some of the best quality beef in the world. Wagyu - which stands for Japanese cow - is world renowned for its quality and commands a high price. In several areas of Japan, wagyu beef is shipped carrying area names, the most well known of which is probably kobe steaks. What you get in the end is a genuinely noticeable difference in quality and a tasty melt in the mouth burger. It comes served with smoked cheddar, crispy onions, relish and sweet potato fries and a host of add-on options and really is the standout dish on this new menu. Other indulgent options include the new Chicken, ham and crème fraiche pie (£14.50), the Croxton Manor Cheddar soufflé (£10.95) or delicious pan-fried seabass fillets (£17.95) with mashed potato, green vegetables and a brown shrimp, crab and white wine sauce. The ultimate spring dish is there too, lamb. Juicy and tender, the lamb is served with all the traditional roast accompaniments which also makes The Gate a great destination for a Sunday roast. On ordering meat dishes be sure to make clear how you would like it cooked if you do have a specific preference . If you can fit anymore in there is a plethora of sweet options for afters with a glazed lemon tart the spring offering on the new seasonal menu. In terms of drinks The Gate’s cocktail menu has also been revamped with the likes of tart Lyme Breeze (£5.95) which uses Black Cow vodka, fresh lime, elderflower cordial, topped with cranberry juice. There is also a new gin cocktail on the menu, the Silent Rose (£5.95) which includes Silent Pool gin, rhubarb and rosehip, topped with apple juice. In the modern area of fast food eating and takeaway chains and as we see more and more of our beloved institutions the Great British pubs close down, Service was reasonable and staff were attentive but not overly intrusive. The Gate has what seems a near perfect blend and it won’t leave you needing to remortgage despite it’s plush setting. Visit www.thegatepub.co.uk to find out more and book a table.